I have learned patience with the treatment process. We do four treatments before doing any kind of tests to reveal if the chemotherapy is working. Eight weeks of treatment without knowing if you are accomplishing anything other than pumping poison into your body. At the worst of times it is very easy to wonder if the nausea, diarrhea, fatigue, and disruption to life are worth the effort. 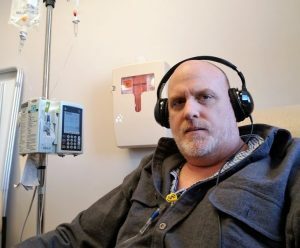 It was two treatments in when I began to feel hopeful. My off chemo weeks started to feel more normal. Sure, I was tired, but I was working full weeks. Slowly those off chemo weeks began to feel more like my “new normal” and I began to wonder if something was happening inside me. Last week I got my first CEA result from this round. What had climbed to 3.3 was back down to 1.6! Now, my oncologist will be quick to tell you that anything under 5 is normal and we should not read too much into it…but the numbers are no longer climbing. CEA is a protein that can serve as a marker for some types of cancer. It has served as a significant marker in my diagnosis and treatment. I watch it carefully and am encouraged to see the number dropping. When I was in for fluids today I asked if my scan results were in yet. Only having the scans yesterday, my expectations were low. A few minutes into my fluids and Nicole showed up. She was all smiles. My CAT scan was clear. Based upon my form of cancer and their years of treating people like me there are areas they would normally expect the cancer to move if it was going to spread. So far they are not seeing any signs of my cancer spreading to other areas of my body. I like the sound of that. My MRI was equally as encouraging. When we began this round of treatment my largest liver lesion measured 5.7 x 4.3. This last MRI showed the largest lesion to be 3.2 x 3. The chemotherapy is doing what it is supposed to do. My body is responding to the treatment in the best way possible. Next Friday I will meet with my oncologist and learn more about these results, but all signs are that we made the correct decision to start treatment right away. I am hopeful this will mean we can continue treatments through July as planned and then take another break. To say I am feeling blessed beyond all words is a giant understatement. I gain strength from your bravery and tenacity while fighting this disease all the while serving others. Blessed are we that walk at your side. Wish you peace and send love and hope always.